Steamworld Heist is a game about getting in there, effing dudes the hell up, and then getting out as quickly as possible with all of their sweet, sweet loot. As steam-powered robot space pirate Piper and her loyal crew of cowbots (that's cowboy robots, not robot cows), you'll be taking out anyone who preys on the weak and disenfranchised just trying to make their way in the space surrounding a planet that blew up. Heist takes the world that was first established in 2010 with the little-played DSi store game Steamworld Tower Defense and evolves it in several new directions at once. First, in keeping with the way this series was apparently planned, it's an entirely new genre all over again. 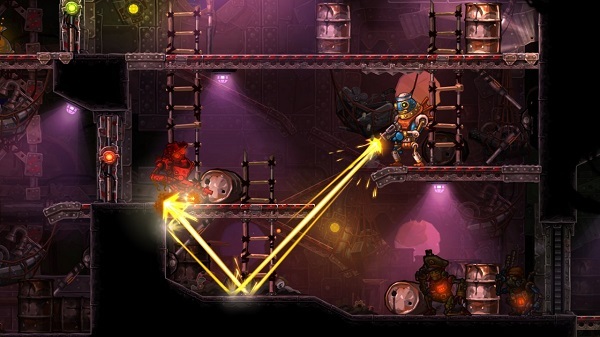 While Steamworld Dig was a sort of Metroid-meets-MisterDriller experience and Tower Defense was, well, tower defense, Heist turns the franchise into a 2D tactics RPG, complete with customizable loadouts, cover, and grid-based movement. I've also never seen a game that tries to do side-scrolling tactics like this. Whenever we hear about tactics RPG it's almost always overhead/isometric, and this total shift in perspective allows for a few fun and interesting new wrinkles for how to make the game work. Instead of using hit percentages based on distance and defense, Heist gives you the ability to manually aim and choose when to fire (weapon aiming has a bit of a bob to it), and the 2D perspective also gives the ability to ricochet off walls behind an enemy as well. Even if an enemy is all the way across the map, a well-placed shot can still have the effect of missing them, ricocheting off the wall behind them, and hitting them in the rear, which is incredibly satisfying. Also a good shot can take off any character's hat and then you can go steal them for yourself, like the stuffed cat that sits on top of my head and doesn't give any bonuses except for the fact that it exists. Its last big change is that despite being set in the same "universe" as the other Steamworld games, this game is set in space. And like no other option for it, really, because like I said, yo, that planet straight blew the hell up. It's even there in the background, which is pretty cool. The ships you enter are all procedurally generated, but they also have that whole "used universe" thing to them in a superb way. Everything, from the robots themselves to walls and barrels you hide in, looks rusted and old and bulky. I really love the loud "KCHUNG" when your ship docks with another, the sound of the doors opening up for you to load in, even little things like some of the menu sounds. It's rare to call out sound design on a handheld game but this one delivers really well. Like there's a part where you walk into a bar and there's a band playing and it's full lyrics and everything and that's a surprise to see in a full sized console game at times, and it's also even more surprising on the 3DS. I'm also going to take this moment to shout out the characters. They're charming, well designed, and even more interesting in the way they're not super obviously gendered. Piper is clearly a woman robot but without any of the terrible signifiers. No bows, no giant robot hair, not even robo-boobies. Characters like Sally also do a good job of not just being the same svelte, tiny frame for a woman, instead looking like someone who can really pack a wallop. Very good work on a lot of these designs. While Heist is definitely an excellent, fun, and satisfying game, it does lack some of the depth that the best games in the series have. It does start to ramp it up later, introducing things like floors that catch fire and cover that can activate or deactivate, even abilities for characters like Piper casting an AOE inspire that makes characters stronger and others able to do things like do more damage after being hit. Things like flanking and enemy awareness, though, are very basic to work with. Once a room is visible, enemies just know where you are, so even if one of your people is like at a lower door than the one that was opened, the enemies will still know they're there. No such thing as a last known position or anything like that. I can't knock it too hard for this, though, because it's meant to be a less complex game, and the addition of a light loot system also helps make it so that you don't notice these things as much. The later introduction of things like alarm systems or detonation countdowns also add a fight-or-flight layer to the game, where you've achieved your goal but there's a locked door over there and you only have 3 turns left before more enemies flood in or the ship detonates and, well, you won't know until you check whether it was worth it or not, right? With strong tactical gameplay, a satisfying progression system, and plenty of room for experimentation, SteamWorld Heist makes for an addictive and accessible side-entry in the SteamWorld franchise. 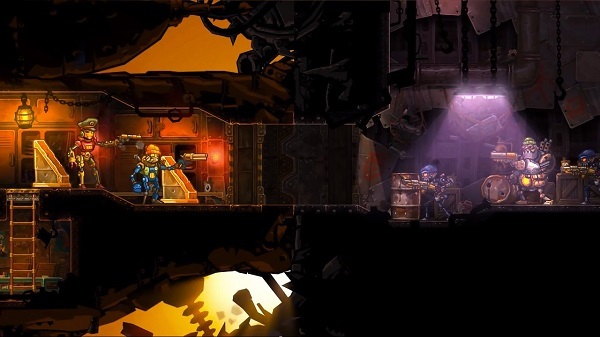 SteamWorld Dig isn't ground-breaking, but its tight action platforming and satisfying gameplay hook will easily keep you entertained for several hours. SteamWorld Heist quickly seized my attention with its interesting world and charming characters.